All done and off my conscience! 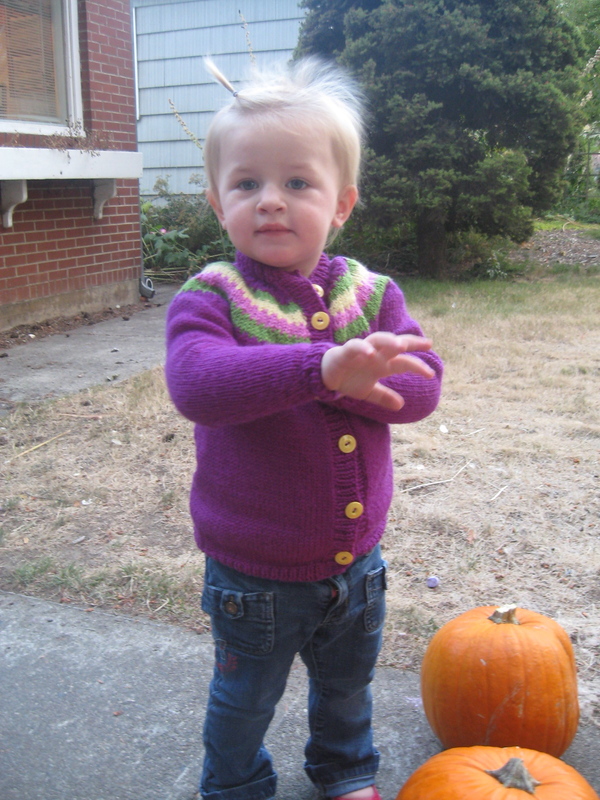 It is easy to read into this picture what happened – a mom stuffed a barely awake toddler into her just finished sweater to document the fact that she finally sewed on the buttons after a lot of neglect. Then the toddler stands outside in the breeze with her bed-head puffing into the wind, being testy with siblings who approach the pumpkins which she is guarding. But she is also very pleased with her sweater and won’t let anyone take it off after we go inside. And mom is pretty pleased too – because finishing something is all part of the fun of starting it! how cute! where did you find the pattern? My sister-in-law just made that sweater for my oldest daughter’s 7th birthday. Here, have a looksee for yourself. I love it! It is Wendy Bernard “Drive-thru”, and you can buy the pattern off of her blog “knit and tonic” – I meant to say that in the post, but woops! Wow, Rachel. I’m always impressed by your handiwork. Very cute! Well done!! It really looks good, Rachel. Goodness she is a cutie, she looks real proud of the sweater her mommy made for her. I’m still working away on Athan’s sweater. I got sidetracked for a few days while I was busy being discontent and wringing my hands over something but the Lord has been gracious and I got the spring in my step back so I’m back at it. I WILL let you know when I get done. Oh wow â€“ that’s gorgeous. I love knitting and I’ve tried sweaters, but I get so fed up with the patterns that, for me, are as good as written in Chinese. 🙂 Maybe I should try this one.